That is wonderful information, and not available anywhere else I'd wager. This thread has great potential I think. A chance for owners of these artifacts from a bygone age to allow them to be seen by a large group of fellow enthusiasts: maybe collectors will come to better understand and appreciate this little corner of early radio history. I'm known for my over length posts and pictures I suppose, but bear with me folks, this one promises to be even longer than usual. To tell this story adequately will require some explanation, but more than that, it requires quite a few pictures as well. I'm blessed in so many ways that they are beyond counting - - in collecting early Superhets I'm equally blessed because I've been lucky enough to come into possession of two un-built kits from the 1920's. This is the story of one of them. From the assortment came a large number of Framingham papers that must surely have constituted a Dealer's kit, the information for a dealer to have on hand, and to hand out to prospective buyers. Most important, from the dross came realization that Framingham had marketed both plans and parts for their own Superhet at some point. Previously, about all I knew of the company was they produced rheostats, potentiometers, and a few other small component parts in the early-mid 1920s. Yes, the trove included maybe as many as a couple of dozen NOS Framingham parts - - - very narly enough to construct the Superhet. I acquired all of the necessary transformers save one - - - a lot of tube sockets and rheostats - - - even the wooden parts for the Framingham Loop Antenna. The transformers are curious - - quite different in construction from any I've previously seen. It was fairly easy to replicate the lone missing transformer. The devices are housed in identical sized tin cans - - the type used for preserving food. The cans have mounting feet added on the bottom and the top opening is filled with a Bakelite disc supporting the terminals and bearing engraving - - - testament to what the individual item is. I Have since located a suitable cabinet, a beautiful front panel sheet, and most of the missing bits to build the Framingham - - - except for the two Framingham variable tuning condensers. I have advertised repeatedly, asked anyone I could think of, and tried to pass the word - - - so far they have eluded me. The parts trove included only the wooden support arms - - missing were the required Litz wire, the center support, and the base. The picture did not provide a clue to what the missing center fixture looked like so I rolled-my-own, so to speak. The pictures did not supply any clues to what the missing loop base might have looked like so I was pretty much on my own. A salvage two dollar electric table lamp supplied the base with a suitable amount of cast iron lamp weights installed inside for stability. With no clues to what the original base might have looked like, I decided I wanted the loop to swivel on the base - - - easy enough really - - - but - - - I needed something to conceal the transition from the wooden upright to the actual base. I finally hit on using the brass Ferrell from a old porcelain doorknob, heated and blacksmithed into a square opening on one side - - - it just slipped on the bottom of the wooden upright and is held in place with a single brass screw (not seen in this photo) The whole shebang was then texture painted, given an over coat of black lacquer, and a final coat of matte Defthane. Please accept my apologies for going on at such great lengths but I thought the story of the only known (to me anyhow) Framingham Superhet required more than the usual amount of pictures and description. OK - - - C'mon foks - - - I know we have members with other early Superhets - - lets see em folks. Last edited by Dale Davenport on Jun Sat 13, 2009 3:55 pm, edited 3 times in total. Really nice loop, great job. Looks perfect. it was built in the 20s. Where did you get the Litz wire? wire that I trying to fix for a friend. photograph and post tomorrow or Sunday. Should a thread as important as this one, be made into a "sticky"? Thanks for the posts guys. Great stuff. Last edited by golfguru on Jun Sun 14, 2009 7:54 am, edited 1 time in total. The tuning Condensers you describe likely are "Remler," from Gray & Danielson in San Francisco. 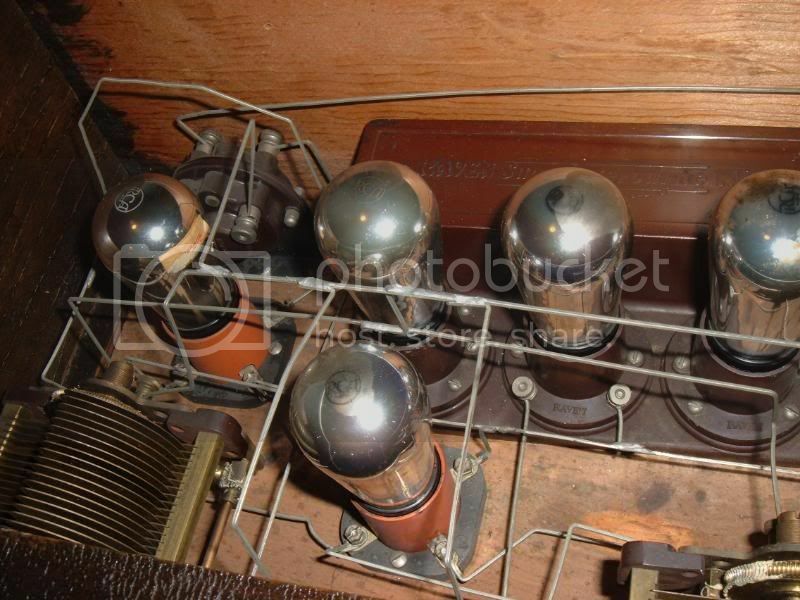 Early Superhet designs seemed to favor Tuning Condensers from General Radio more than other manufacturers. From about 1925, the trend switched to the Remler units. Likely more Superhet designs specified them than any other brand. What is not generally known: Remler produced these devices in a variety of types, including SLF and SLC models. Some models of Remler Tuning Condensers even have an adjustment built in so the plates change direction - - for instance - - - a choice of the plates meshing when the knob/shaft is turned clockwise, or with the adjustment, they would un-mesh when turned clockwise. A very handy feature on some circuit designs. Yep Dale, those look like a match. So now I am wondering if this was a kit, or a complete homebrew. Many of the brackets appear to be home made, filed at odd angles and such. Some of the wire routing choices (for the bus wire) seem to be ad-hoc. Well, I'll put in my contribution--my Radiola 24. Bought it at a meet in '94 as a kit. Previous owner had stripped off the rotten leather and had everything taken down to pieces--even melted out the pitch from the catacomb. He threw in some thick textured vinyl, and I bought the whole shebang for $60. Took a few weeks to sort out. Had to replace all the cloth wiring as it was heavily oxidized. Only thing left to do is to add the handle, and I haven't had time to get it done. Bought a batch of used 199's for $150. They sport repro covers. For the batteries I bought three new Number 6's. The B battery stack is a DC-DC converter tapped at the proper points. The end batteries hold a pack of 5 AA batteries. The C battery is a faithful repro that holds three AA's. I included pictures of the original 768 cover and the cleaned up image. Plays decently, and it's my oldest portable in my collection. Gorgeous: great workmanship Bill. That is truly a beautiful and well executed job. Is the material in/on the top of the "B" batteries really sealing wax? Or is it some later material - - a plastic or something similar? At any rate - - that is not only a seldom seen receiver but a product of beautiful workmanship and effort. Congratulations. Tinted Alumilite--molded from an original wax top. So, how rare are they? I don't know, I deal with mostly portables 1939 and up. A Beautiful job of it. They look like sealing wax for sure. While the 24 was cheaper than the 26, and offered the same performance, it was discontinued by Christmas 1925. Either Westinghouse had to get a contract to balance the 40%-60% agreement, or perhaps Sarnoff preferred a model designed by his own organization to one created by GE~~edit~~7079 were made between April 30 and July 31. Alan doesn't quote a total production for the Radiola 24 - - - but - - - that was pretty low for the quoted time span. 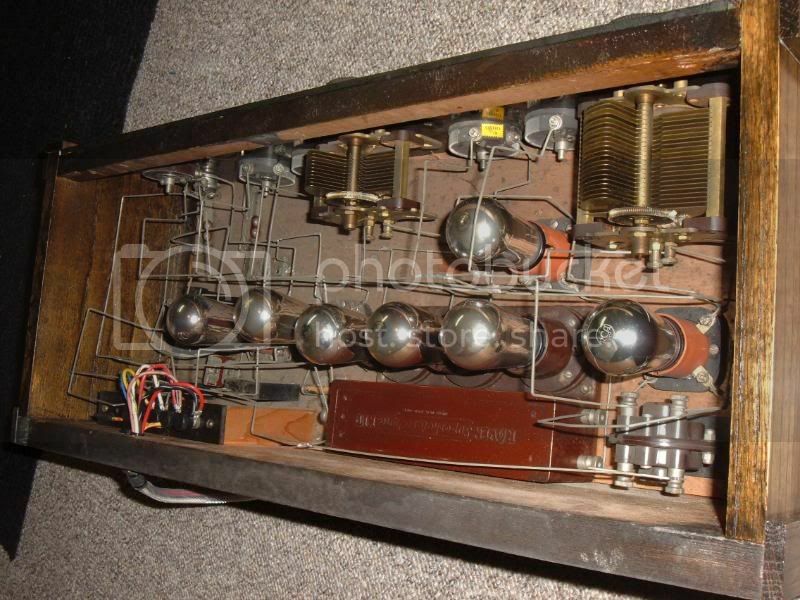 By comparison, 19,507 of the Radiola "26" were produced and something over 148,000 Radiola, Model AR-812, left the nest. As far as keeping things out of sight of the House Frau, I'm still doing that after more than a half century of collecting and thirty five years of marriage. Lovely job. What are the pins on the side of the battery for? Thanks. I want to thank everyone who has responded to this thread. The superhet photos are awesome! 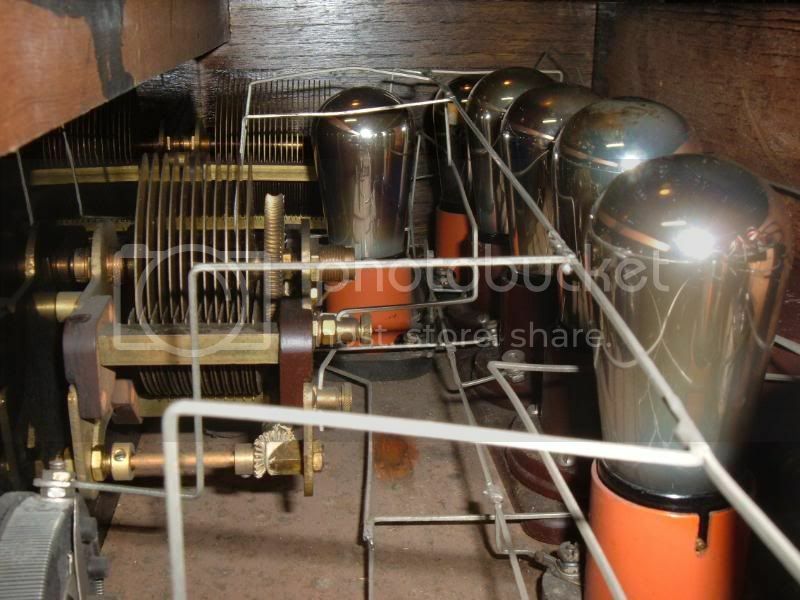 Bill, your restored Radiola 24 and a photo of you operating it is outstanding! Dale, your restoration efforts on the Framingham loop and receiver are commendable. Outstanding work that we can all strive to accomplish. I hope you will find the correct tuning capacitors for it. The scan above on the Remler tuning capacitors got me to thinking about one of my best superhets. The Remler ad says that the capacitors are available in either the Straight Line Frequency or the Straight Line Wavelength variety. I have never seen more than one variety of these capacitors, and I don’t know what makes them different. In the following superhet, the heart of what makes it function correctly is the Straight Line Frequency (SLF) tuning capacitors, and they are most definitely shaped different than the Remlers. Note: The first rotary capacitors, and the most common capacitor used for early radio work, had semi-circular plates, and they were called Straight Line Capacity capacitors. Meet the McLaughlin, one of the earliest single-dial superhets ever made. This superhet was very much different than the norm of the times, and was definitely ahead of the times in performance. Here is a scan from the construction article in the October 1925 Popular Radio Magazine, which shows the author and inventor, Mr. James Leo McLaughlin, tuning his superheterodyne masterpiece! Mr. McLaughlin was an early superheterodyne authority. His first single-dial designs (that I am aware of) were described in late 1924 QST articles. Here is a photo of my McLaughlin that I snagged off of eBay in September of 2007. I probably made a few enemies (perhaps forum members?) when I won this thing! It is in near mint condition, with Precise IF transformers, audios, tuning capacitors, and "filtoformer.” Many of the parts in this set, including the case, front panel, and Benjamin base panel, were made specifically for this radio. Other high quality parts include the Weston meters and the General Radio rheostats. Here is a rear view of the Mclaughlin. And hear is a close up of the heart of the receiver, the Precise “Synchrodenser” variable SLF capacitors. Tuning a TRF radio with multiple capacitors on one shaft was fairly easy, because the circuits were all tuned to the same frequency simultaneously. Tuning a superhet was a different story though, because the oscillator frequency had to change at a different rate than the RF tuner frequency. Many engineers at the time thought that it was impossible to make a single-dial superhet. Mr. McLaughlin solved the problem with SLF capacitors. Being Straight Line Frequency capacitors, as the two capacitors turned in unison, or synchronously, the difference in frequency between the oscillator and RF tuner would always track. This difference in tracking frequency was the IF, of course. As it turned out, SLF capacitors were not required to make a single-dial superhet. In his 1928 edition of Modern Radio Reception, Charles Leutz states that the SLF capacitor is the only type of condenser that can be used in a single-dial superheterodyne (page 208). I don’t know the entire story, but the Radiola 60 of 1928 was a single-dial super, and it used padder and trimmer capacitors to accomplish the proper tracking, without the use of SLF capacitors (at least to the best of my knowledge it did not use SLF capacitors. I have never inspected a Radiola 60 up close, but I have seen the schematics). Even so, the McLaughlin deserves a place in history as one of the first single-dial supers! It must have been a strange sensation in those days to tune an 8-tube receiver with a single dial. Last edited by Duane B on Feb Mon 19, 2018 4:33 pm, edited 1 time in total. Duane. Lovely pics of the McLaughlin. Two of the pins connect the 5 AA's to the converter. The other two direct the tapped output voltages to their respective screw terminals. It fits into the radio as one complete unit, and look like four separate 768 BC batteries. You jumped here, I see, after I posted to the old thread. Sorry to duplicate. Raven Radio, Inc. of Albany, NY announced their first kit in October 1924, although the brochure gives September 3, 1924. It was an eight tube set with three tuning dials. They designed it so the oscillator variometer dial might match the other two tuning dials giving the illusion of three tuning dials like a TRF. It had separate IFs and a filter as also shown in this thread . The basic kit was $19.95 from M. Wards. The kit with all parts but no cabinet was $57.95 from Barawick (mail order) in Octobr 1924 and had a baseboard 36 inches long! These ads in the next posting. It's said the IFs/Filter cases were made at a bowling ball factory. No 12 tube Raven was offered. The builder just added extra stages onto an 8 tube set. The modular kit and plans for it came out in December 1924. I assume the change to a module was to get away from any pressure RCA might impose. More than a handful of manufactures went to a module to get around RCA. 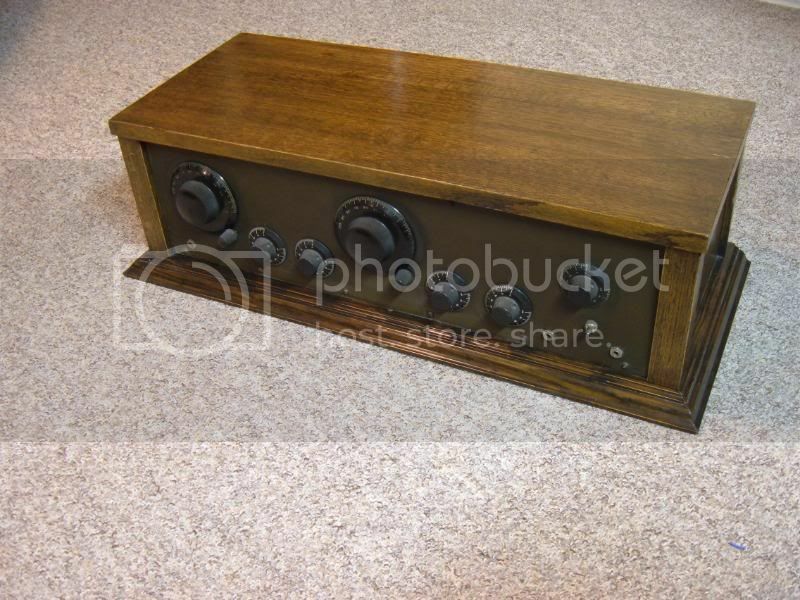 One of the eBay radios posted by Duane was designed to look like a three dial TRF. It's a small set (18 inches) by comparison to their previous plan (36 inches). The panel does appear to be rubber as opposed to bakelite. Has very few parts outside of the module and would have been very easy to assemble. See the ads in the next posting. P.A.E. Armstrong wrote a book about his Raven radios which is as scarce as hen's teeth! And, no, sorry, I don't have any scheme for Ravens beyond some info Dale sent me years ago, part of which is already posted on the old thread. Yes, the Raven is a very rare bird! Never saw a 1920s Superhet I could live without! Last edited by Rick A on Jun Tue 16, 2009 4:50 am, edited 2 times in total. First ad is from Monkey Wards catalogue, Fall 1924. Second is a Barawick ad, from Radio News, Oct 1924. Third one is from Popular Radio, Dec 1924. The last is from Popular Radio, Feb 1926 and was about the last Raven ad found. Interesting, that by that time, they called the module... "a complete compact monobloc radio frequency long wave length unit". WOW! No wonder they went out of business! Wow, what a great topic! Here's a few pictures of my humble addition to this thread... it fits in well with Rick A's last post. One of the first radios I've ever bought, and still my favorite. The Raven Superhetrodyne Kit. It must have been a real thrill to be the set builder back in the 20's. Soldering all this wild stuff together, applying electricity, and if your lucky enough to have a working set, being able to tune into the airwaves and the world beyond. To me, that's what makes the 20's kit sets so interesting. Could the 12 tube Raven be a factory experimental set, that was never offered as a kit? It seems unlikely that a casual builder would engrave an extra long panel and add the Raven logo. The set was originally intended to use the 2nd detector and four audio stages, as indicated by the five jacks on the right side of the panel, but the last two audio stages appeared to have never been completed. Jerry- WOW! 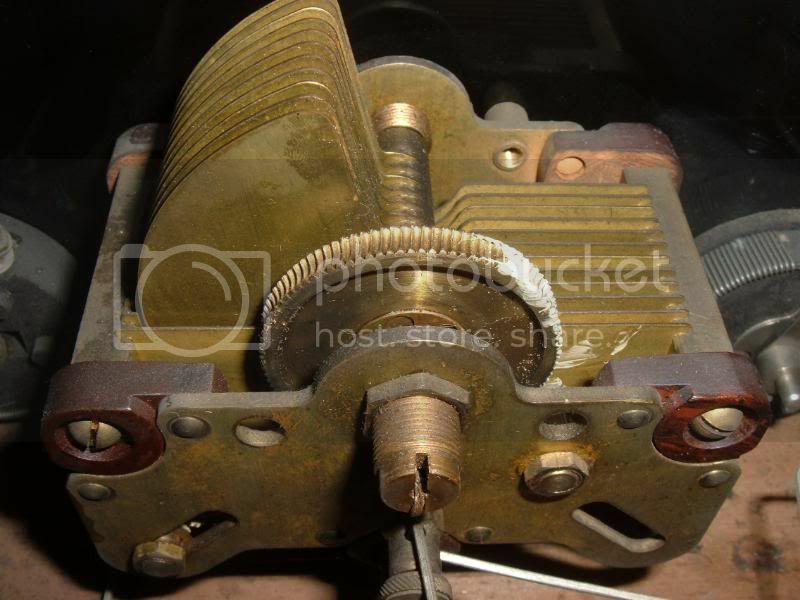 Look at the engineering that went into those tuning capacitors and the bevel gear drive using helical cut gears! I can not imagine what a capacitor like that would cost today to build. But why the two redish looking tube sockets? Some sort of "low loss" types? Thank you to everyone - they are amazing radios,a nd this thread should be an excellent resource.